Schatzi von Eich (aka Schatzi) is a fabulous 1994 chestnut sabino Thoroughbred Mare by All for Fun out of Exact Pleasure (by What a Pleasure). 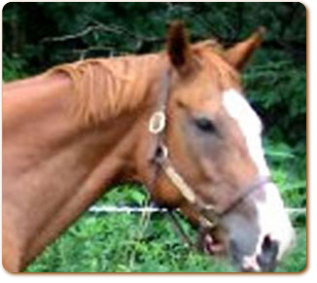 She stands 16.1 hh and is a solid bodied mare. Two high stockings, a big blaze face, a lower white lip coupled with several HUGE white belly spots, make this mare a wonderful addition to our breeding program! This VERY large framed mare has wonderful, proven bloodlines coupled with excellent conformation, beautiful movement, a kind demeanor and a stunningly beautiful head - all attributes we look long and hard to find in our broodmares! Schatzi Von Eich was in foal for 2011 to Sir Knight's Shadow. Schatzi was unable to safely deliver her foal. After transport to the University of Guelph Emergency Services, the doctors were unable to deliver a surviving foal. The foal took a couple of breaths but was unable to be resuscitated. He was a long legged black colt with a white blaze and stockings. Almost the spitting image of his sire. Schatzi is unable to be bred again and is now retired from the broodmare band and will remain here until a loving home can be found for her.